The Kentucky Wildcats men's basketball team is an American college basketball team that represents the University of Kentucky. Kentucky is the most successful NCAA Division I basketball program in history in terms of both all-time wins (2,293) and all-time winning percentage (.765). The Wildcats are currently coached by John Calipari. Kentucky leads all schools in total NCAA tournament appearances (59), NCAA tournament wins (131), NCAA Tournament games played (184), NCAA Sweet Sixteen appearances (45), NCAA Elite Eight appearances (38), and total postseason tournament appearances (68). Further, Kentucky has played in 17 NCAA Final Fours (tied for 2nd place all-time with UCLA), 12 NCAA Championship games, and has won 8 NCAA championships (second only to UCLA's 11). In addition to these titles, Kentucky won the National Invitation Tournament (NIT) in both 1946 and 1976, making it the only school to win multiple NCAA and NIT championships. Kentucky also leads all schools with sixty-three 20-win seasons, sixteen 30-win seasons, and six 35-win seasons. Throughout its history, the Kentucky basketball program has featured many notable and successful players, both on the collegiate level and the professional level. Kentucky holds the record for the most NBA Draft selections (125) as well as the most #1 NBA Draft picks (3). The Wildcats have also been led by many successful head coaches, including Adolph Rupp, Joe B. Hall, Eddie Sutton, Rick Pitino, Tubby Smith, and John Calipari. Kentucky is the only program with 5 different NCAA Championship coaches (Rupp, Hall, Pitino, Smith, Calipari). Three Kentucky coaches have been enshrined in the Naismith Memorial Basketball Hall of Fame: Rupp, Pitino, and Calipari. Former Wildcat players that have gone on to become head coaches include C.M. Newton, Pat Riley, Dan Issel, Dwane Casey, John Pelphrey, Steve Masiello and Travis Ford. During this early era Kentucky was unstable in that the school went through multiple coaches, many stayed only one or two seasons. Records indicate that the first head coach of the Wildcats was W. W. H. Mustaine, who in 1903 called together some students, took up a collection totaling $3 for a ball, and told the students to start playing. The first recorded intercollegiate game at the college was a 15–6 defeat to nearby Georgetown College. The team went 1–2 for their first "season", also losing to Kentucky University (later Transylvania University) but defeating the Lexington YMCA. Through 1908, the team did not manage a winning season, and had an all-time record of 15–29. In the fall of that year a full-time head coach was hired, Edwin Sweetland. This made him the first paid coach in Kentucky's basketball history. That year, the team went 5–4, and only three years later, boasted their first undefeated season with nine victories and no losses. The 1914 team under Alpha Brummage, led by brothers Karl and Tom Zerfoss, went 12–2 and defeated all its Southern Intercollegiate Athletic Association opponents. In 1919, George Buchheit became the new head coach of the Wildcats. An alumnus of the University of Illinois, he brought with him a new system of basketball. The "Buchheit system" or "Illinois system", focused on defense and featured one player standing under each basket, while three roamed the court. Buckheit varied the system he learned in Illinois in one important way. While the Illinois system employed a zone defense, Buchheit's system used an aggressive man-to-man scheme. On offense, he used a complicated system of passing called the "zig-zag" or "figure eight" offense. Although the team had a losing season in Buchheit's first year, they won the first-ever Southern Intercollegiate Athletic Association tournament the next year, defeating the heavily favored Georgia Bulldogs. Both of these teams were composed entirely of native Kentuckians, anchored by All-American Basil Hayden. The tournament victory was considered Kentucky's first major success, and the 1921 team became known as the "Wonder Team." In 1922, the team was unable to build on the success of the "Wonder Team." Although every player was eligible in 1922, two key players, Hayden and Sam Ridgeway, were injured before the start of the season. Hayden returned from his knee injury during the season, but was never able to play at the level he had the previous year. Ridgeway fought a year-long battle with diphtheria, and although he recovered, never played for the Wildcats again. The remaining three members of the "Wonder Team" went 9–5 for the season, and bowed out of the SIAA tournament in the second round. Buchheit remained as coach through the 1924 season before moving on to coach Trinity College (later Duke University). A different coach would guide the team for each of the next four years. C.O. Applegran immediately followed Buchheit, and his 1925 team posted a respectable 13–8 record. Applegran in college had played for the University of Illinois, where he became an All-American. The next year, Ray Eklund led the team to a 15–3 record, and produced UK's second All-American, Burgess Carey. The record was enough for Kentucky to win their first regular season conference championship in the Southern Conference. Seeing the cupboard largely bare for the upcoming year, Eklund resigned shortly before the start of the 1927 season. The team scrambled to find a new coach, and former player Basil Hayden left his coaching job at Kentucky Wesleyan College to answer the call. An inexperienced coach and a roster largely depleted of talent left the Wildcats with a 3–13 record that year. The disappointment convinced Hayden that he wasn't the "coaching type", and he resigned after the season. Fortunately for the Wildcats, 1927 would be their last losing season for six decades. The Wildcats' new coach for the 1927–28 season was John Mauer. Although he had a talented group of players moving up from the junior varsity team, Mauer quickly discovered that his players did not know the fundamentals of the game. He began a regimen of three-hour practices five days a week during the preseason. The practice began with half an hour of shooting drills and usually ended with a full-court scrimmage. Between the two, Mauer worked on skill drills and scenarios. Mauer's teams were nicknamed the "Mauermen." Teamwork was the hallmark of Mauer's system. Every player worked on every aspect of the game; there were no specialists. Like Buchheit, Mauer employed a strong man-to-man defense. He utilized a slow-break offense that relied on a complicated system of short passes to get a good shot. Two elements of Mauer's system were new to basketball in the south – the offensive screen and the bounce pass. The latter was so new to most of UK's opponents that it was referred to as the "submarine attack." Over his three-year tenure, Mauer led the Wildcats to an overall record of 40–14. One major prize eluded him, however. Despite having teams that were almost universally acknowledged as the "class of the South", Mauer never led a team to the Southern Conference title. Despite his innate ability for coaching, Mauer lacked the ability to heighten his team's emotions for a big game, a fault that was cited as the reason for his lack of tournament success. Mauer left the Wildcats to coach the Miami University Redskins following the 1930 season. In 1930, the university hired Adolph Rupp, who had played as a reserve for the University of Kansas 1922 and 1923 Helms National Championship teams, under coach Forest C. "Phog" Allen. At the time of his hiring, Rupp was a high school coach in Freeport, Illinois. Rupp coached the University of Kentucky men's basketball team from 1930 to 1972. There, he gained the nicknames, "Baron of the Bluegrass", and "The Man in the Brown Suit". Rupp, who was an early innovator of the fast break and set offense, quickly gained a reputation as an intense competitor, a strict motivator, and a fine strategist, often driving his teams to great levels of success. Rupp's Wildcat teams won 4 NCAA championships (1948, 1949, 1951, 1958), one NIT title in 1946, appeared in 20 NCAA tournaments, had 6 NCAA Final Four appearances, captured 27 Southeastern Conference (SEC) regular season titles, and won 13 SEC tournaments. Rupp's Kentucky teams also finished ranked No. 1 on 6 occasions in the final Associated Press college basketball poll and 4 times in the United Press International (Coaches) poll. In addition, Rupp's 1966 Kentucky squad (nicknamed "Rupp's Runts", as no starting player on the squad was taller than 6'5") finished runner-up in the NCAA tournament, and his 1947 Wildcats finished runner-up in the NIT. Rupp's 1933 and 1954 Kentucky squads were also awarded the Helms National Championship, and his 1934 and 1947 teams were retroactively recognized as the national champion by the Premo-Porretta Power Poll. One of Rupp's early successful teams, he would give the '44 team the nickname "the Beardless Wonders" and "Wildkittens" because according to Rupp, "It was like running a Kindergarten." Of the young players, Kentucky's best player was freshman Bob Brannum, who at the age of 17, would be named consensus All-American, making him the youngest player to ever earn the title. The Beardless Wonders would win nineteen of their twenty-one games, enough to be invited into the NIT. There they would be matched up with an equally young and talented Utah team nicknamed the "Blitz Kids." The game made for an exciting outing with both teams going into the half tied at 24, but with the help of Brannum Kentucky would pull away to win 46–38. Kentucky would lose the next game to home town Saint John's. On the way to its first NCAA title, Kentucky would go on to a record of 36–3. Of these three losses, all were either away or at neutral sites, keeping Kentucky undefeated at home throughout the entire season. Kentucky started off the beginning of the season with a 7–0 record heading into their away game at Temple. However, Temple was able to give the Cats their first loss by one point, 60–59. Still, this loss was not enough to keep the Wildcats down, as they rolled off an 11-win streak before playing at Notre Dame, where they lost 55–64. They would not lose a game for the rest of the regular season. Kentucky continued through the NCAA Tournament to the finals, where they faced the Baylor Bears. Kentucky won its first NCAA title in a decisive 77–59 victory. The season did not end after the NCAA Tournament, as Kentucky who would play in the Olympic Trials, where they went 2–1, only losing to the Phillips Oilers once. This was performance enough to represent the United States in the 1948 Olympic Games. Despite only being a college team, the starting 5 of Kentucky would defeat all of its competition in London, making Kentucky the only team to win both a NCAA title and an Olympic gold medal. Adolph Rupp soon gave this team the nickname "The Fabulous Five", in honor of their accomplishments. For the 1949 season Kentucky had high expectations with most of the Fabulous Five returning. Big Blue Nation's expectations were met as the 1949 team won one more game than the previous year including both a SEC regular season and SEC tournament championship, while also getting back to the Final Four that March. In the finals Kentucky faced the Oklahoma A&M Cowboys, a team that had previously seen success in the tournament with back-to-back championships in 1945 and 1946. The Fab Five would succeed again winning 46–36 and Kentucky's only back-to-back NCAA championship. Kentucky was the second program in NCAA history to win back-to-back championships (there have been six other schools since). With a returning star player like Bill Spivey, Kentucky hoped to carry their success into the new decade. All did not look well after the Wildcats lost their first game by 11 to Saint John's at home, but they would pull it together for the Sugar Bowl Tournament, which they won, beating NCAA runner-up Bradley. Heading into rival Tennessee now No. 2 Kentucky was looking at the beginning of a tough six away game stretch; and tough it was. After losing to Tennessee, Kentucky would struggle to chain two wins together, losing every other game. They would defeat their next fourteen opponents, including getting revenge in SEC tournament championship over Tennessee. Heading into the post-season, No. 3 Kentucky would play a powerhouse CCNY team in the NIT, missing the NCAA tournament. The Wildcats were no match and were thrashed by the CCNY Beavers, 50–83. The same CCNY would go to win the NIT, and then the NCAA championship. They are the only team in college basketball history to accomplish this feat. Coming off a successful but titleless 1950 season, the Wildcats continued their dominance into the new decade. Over the season Kentucky would defeat four top 10 teams, and would be ranked in the top 5 the entire season. And with only one loss heading into the SEC tournament it looked like Kentucky would once again claim both SEC championships and their dominance over their conference. Vanderbilt had a different idea however, and would knock off the top ranked Wildcats in the SEC tournament finals denying them an eighth straight SEC tournament title. Kentucky was determined to not repeat the result it had in the SEC tournament in the NCAA finals, where they defeated fourth ranked Kansas State 68–58. Adolph Rupp was the head coach at Kentucky during the year of the point-shaving scandal of 1951. In 1945 former Kentucky football player Nick Englisis met Kentucky basketball legend Ralph Beard while the two played football at Kentucky. Englisis entered the gambling business when he left the football team in 1946, then approached three Kentucky basketball players Ralph Beard, Alex Groza, and Dale Barnstable with his associates in late 1948 about potentially point shaving (fixing the score of games) during the upcoming season in exchange for money. The three players agreed to point shave and successfully shaved points in several games during the 1948–1949 season until an effort to point shave caused the Wildcats to lose to the Loyola Ramblers in the National Invitation Tournament. Groza, Beard, and Barnstable attempted to win the game under the point spread but kept the score too close, allowing the Ramblers to win the game with an impressive performance at the end of the second half. Kentucky faced Villanova in their first game of the NCAA Tournament following the loss to Loyola and the three players attempted to win over the point spread. When Groza, Beard, and Barnstable failed to win over the point spread, it caused Englisis to lose all of his money and ended the point shaving deals between Englisis and these three players. On October 20, 1951, Alex Groza, Ralph Beard, and Dale Barnstable were arrested for taking bribes from gamblers to shave points during several games including the National Invitation Tournament game against the Loyola Ramblers in the 1948–49 season. The team returned with a vengeance the next year, posting a perfect 25–0 record (Rupp's only undefeated season), for which it was awarded the 1954 Helms National Championship. In addition, Kentucky also finished ranked No. 1 in the final Associated Press poll. On the team were three players who had graduated at the conclusion of the previous academic year. When, at the last minute, the NCAA ruled these players ineligible from post-season play, Rupp decided to skip the 1954 NCAA Tournament in protest. Early into the season it was obvious that the "Fiddlin' Five" were not like Rupp's teams earlier in the decade. They played around and made mistakes, which Rupp described as fiddling. In fact the Fiddlin' Five still has the most losses out of any Kentucky's championships, with six, three of those were in four games. Unlike the Fab Five or the 1951 teams, the Fiddling Five would yoyo in the rankings with their lowest a No. 13 coming after 56–57 loss to unranked Loyola Chicago. Kentucky would catch fire through the tournament though and would win their fourth title over No. 18 Seattle in the confides of Louisville's Freedom Hall. Rupp's last Final Four team and one of his last chances at a 5th NCAA title occurred in the 1965–66 season, with Kentucky going all the way to the NCAA title game. The now historic 1966 NCAA championship game against Texas Western (now University of Texas-El Paso or UTEP) marked the first occurrence that an all-white starting five (Kentucky) played an all-black starting five (Texas Western) in the NCAA championship game. Texas Western won the game 72–65, on the night of March 19, 1966. Contrary to popular belief, this game was not a huge "upset" as while Kentucky entered the tournament with only one loss and ranked No. 1, Texas Western also had only one loss and entered the tournament ranked second. Kentucky was a 6.5 point favorite in the game The game was depicted in the film Glory Road. This game, and the result of it, were especially significant as the game came at a time when the civil rights movement was coming into full swing around the country. In 1969, after actively recruiting black players for over six years (his first formal scholarship offer was to Wes Unseld in 1964), despite most of the other SEC teams threatening to boycott if a black player took the court), Rupp finally signed his first black player, Tom Payne, an athletic 7'-1" center out of Louisville. This ended the aspect of all-white Kentucky teams forever, and marked a new era with many notable black Kentucky basketball legends, including Jack Givens, Sam Bowie, Kenny Walker, Jamal Mashburn, Tayshaun Prince, Rajon Rondo, John Wall, Anthony Davis, and Karl Anthony Towns. The late Rupp years looked promising with Dan Issel's commitment to the Wildcats in 1966. Over the next four years Issel would score an average of 25.7 per game, adding up to 2,137 points in his college career. This made Issel the player with the most points to ever play at Kentucky, a feat that has not been matched to this day. This included his 53 points scored against Mississippi State in 1970, the most by a Kentucky player in a single game and breaking the previous record of 51 points held by Cliff Hagan. Issel would not capture the national championship in his college years, but would go on to make a name for himself in the ABA. After 1966 Rupp would see continued success, but the Final Four eluded him. The Wildcats would end with a 13–13 season and miss the tournament all together in 1967, then reach the Elite Eight and Sweet Sixteen in the next two years. Sporting a senior Dan Issel, 1970 team looked to be truly special, perhaps one to dethrone the UCLA dynasty. Ranked #1 in the nation with a 26–1 record overall, Kentucky nearly missed a Final Four birth in a 106–100 shootout against Jacksonville. Rupp was forced into retirement in March 1972, after reaching age 70. At the time, this was the mandatory retirement age for all University of Kentucky employees. He was a 5-time National Coach-of-the-Year award winner, a 7-time Conference Coach-of-the-Year award winner, and was elected a member of both the Naismith Memorial Basketball Hall of Fame and College Basketball Hall of Fame. Further, since 1972, the Adolph Rupp Trophy, considered one of the nation's premier basketball awards, has been given by Commonwealth Athletic Club to the nation's top men's college basketball player. In addition, the University of Kentucky retired a jersey in his honor in the rafters of Rupp Arena, a 23,500-seat arena named after him, dedicated in 1976. Joe B. Hall was the head basketball coach at Kentucky from 1972 to 1985. Although he had been an assistant at Kentucky since 1965, Coach Hall was given a difficult task: to follow in the footsteps of his legendary predecessor, Adolph Rupp. In the 1978 NCAA Tournament, he coached the Wildcats to their fifth NCAA championship. He was named National Coach of the Year in 1978 and SEC Coach of the Year on four different occasions. His record at UK was 297–100, and 373–156 over his career. Coach Hall would win the title once in 1978 as well as making the final four in 1975 and 1984, and the elite eight in 1972, 1973, 1977, 1983. Bob Knight – Player for Ohio State in 1960 and coach at Indiana in 1976, 1981, and 1987. Dean Smith – Player for Kansas in 1952 and coach at North Carolina in 1982 and 1993. After a year of playing in the freshman league and a disappointing sophomore season, Hall's Super Kittens returned with hopes of finally bringing Kentucky its fifth title. They nearly did just that, guiding Kentucky to a runner-up finish to UCLA in the 1975 NCAA tournament but not before avenging their 20-point defeat to an undefeated Indiana team. Despite losing in the championship game, it would give freshman Jack Givens a taste for success that would help propel Kentucky to the title three years later. It had been twenty years without a championship in Lexington, and along with pressure of following a hall of fame coach, Hall would nickname the 1978 season the "Season Without Celebration." The pressure to win was immense on both players and coach to bring home the title, especially with a senior laden team that had gone to the finals as freshmen. Kentucky would hardly lose its composure all season or break under pressure, winning 30 of 32 games and defeating eight ranked teams along the way. By the time Kentucky reached the tournament finals they seemed bound to win the title, though Duke would give Kentucky their all. With the help of senior Jack "Goose" Givens' 41 points, Kentucky defeated the Blue Devils 94–88, and finally won their fifth title and first in 20 years. In 1985, Eddie Sutton succeeded Joe B. Hall. He coached the Wildcats for four years, leading them to the Elite Eight of the 1986 NCAA Tournament. Two seasons later, Sutton and the 25–5 Wildcats captured their 37th SEC title and were ranked as the 6th college basketball team in the nation by the Associated Press and UPI before losing to Villanova in the Tournament. Kentucky entered the 1988–89 season with a gutted roster. Ed Davender, Robert Lock and Winston Bennett had all graduated from school, while All-SEC sophomore Rex Chapman left school early to enter the 1988 NBA draft. Additionally, sophomore standout Eric Manuel was suspected of cheating on his college entrance exam and voluntarily agreed to sit out until the investigation was finished. Potential franchise recruit Shawn Kemp transferred out of Kentucky after signing with the school early that year. Unfortunately, Manuel was forced to sit out the entire season as the investigation dragged on, essentially leaving the Wildcats in the hands of inexperienced sophomore LeRon Ellis and true freshman Chris Mills. The two underclassmen struggled to fill the talent vacuum on the court and the Wildcats finished with a losing record of 13–19, the team's first losing full-season record since 1927. To add insult to injury, the NCAA announced at the end of the season that its investigation into the basketball program had found the school guilty of violating numerous NCAA policies. The scandal broke when Emery Worldwide employees claimed to have discovered $1,000 in cash in an envelope Kentucky assistant coach Dwane Casey sent to Mills' father. Later Emery settled a libel lawsuit filed by Casey for a substantial amount of money. Casey was not in Lexington when the envelope was supposedly mailed and the father of Mills said they received no money. 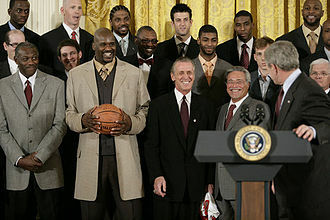 The NCAA rescinded its show cause order immediately after the settlement of the lawsuit, and Casey's career has flourished as an NBA coach. Another player, Eric Manuel, was alleged to have received improper assistance on his college entrance exams and was banned from NCAA competition. Whether Manuel was directly involved has been questioned. Kentucky was already on probation stemming from allegations of an extensive scheme of payments to recruits, and the NCAA seriously considered hitting the Wildcats with the "death penalty", which would have shut down the entire basketball program (as opposed to simply being banned from postseason play) for up to two years. However, school president David Roselle forced Sutton and athletic director Cliff Hagan to resign. The Wildcats were slapped with three years' probation, a two-year ban from postseason play and a ban from live television in 1989–90. In 1989, Rick Pitino left the NBA's New York Knicks and became the coach at a Kentucky program reeling from the aforementioned scandal. Kentucky would be banned from the 1990 and 1991 post season, with the 1990 season suffering a 14–14 record. Kentucky would improve in 1991 with a beavy of home-grown upperclassmen such as Sean Woods, John Pelphrey, Richie Farmer, Deron Feldhaus, and Reggie Hanson along with the talented freshman Jamal Mashburn. Despite their record of 22–6, Kentucky was still banned from the post season and would have to wait another year to see the Unforgettables succeed in the tournament. Beginning with the 1992 season, Kentucky was free of post season bans. Though they lost one more game than last season, this team was most memorable for going to the Elite Eight (for the first time since Sutton's 1986 team) with many returning upperclassmen from Kentucky. The team is also known for playing in what could be considered one of the greatest games in NCAA tournament history against Duke. In this game defending champion Duke were looking to return to the Final Four once again, Kentucky for the first time in almost a decade. The game was hard-fought and physical on both sides all game including Laettner's infamous stomp on Aminu Timberlake, which resulted in a technical. The teams took the lead back and forth until the final minute of the game which resulted in a first buzzer beater shot by Kentucky's Sean Woods to take the lead 103–102, and then Laettner's shot to win the game for the Blue Devils in the final seconds 104–103. This team came to be known as the "Unforgettables" for helping put Kentucky back on the path to success in the 1990s and because the team was made up of home grown Kentucky kids. Kentucky returned a junior Mashburn, along with Travis Ford and Tony Delk. They were expected to reach the Final Four for the first time since Joe B. Hall's 1984 team. The expectations were right, as Kentucky would head into the post-season with only 2 losses and a No. 5 ranking. After winning the SEC Tournament once again, Kentucky stormed to the NCAA Final Four to meet up with Michigan's "Fab Five" a team of young and highly talented recruits that brought Michigan to the championship game the year before. As talented as Kentucky was they would fail to reach the championship game with a 78–81 overtime loss to the Wolverines. But this would be the just a glimpse of a run Kentucky would have later in the decade. Kentucky started the next season ranked #1 but would underachieve, falling short of the Elite Eight for the only time under Pitino. The highlight of the season was the "Mardi Gras Miracle", a game where Kentucky trailed LSU 68–37 with 15:34 left, but outscored them 62–27 over the remainder of regulation to win 99–95. Starting in 1996, Kentucky would put together a string of Final Fours with help from 9 future NBA players. The "Untouchables" as they were nicknamed, would only lose twice, to Final Four bound UMass Minutemen (coached by current Kentucky coach John Calipari) and Mississippi State. It was with their overwhelming talent and chemistry that would win Kentucky their sixth national title in the 1996 NCAA Tournament, Kentucky's first NCAA championship in 18 years. The following year, Pitino's Kentucky team made it back to the national title game, losing to Arizona in overtime in the finals of the 1997 NCAA Tournament. Pitino's fast-paced teams at Kentucky were favorites of the school's fans. It was primarily at Kentucky where he implemented his signature style of full-court pressure defense. By the end of the Pitino era, Kentucky went from banned from the post season to going to three of the last five Final Fours and five of the last six Elite Eights. For this the 1997 team was dubbed the "Unbelievables" for taking a team that was not expected much of to return the Wildcats back to the championship game for a second time. Pitino left Kentucky in 1997 to coach the NBA's Boston Celtics, he then went on to coach Kentucky's in-state rival, the University of Louisville. Orlando "Tubby" Smith was introduced by UK Athletic Director C.M. Newton as the Wildcats' 20th head coach on May 12, 1997, charged with the unenviable task of replacing popular coach Rick Pitino. The Wildcats were at the top of the basketball world at the time, having won a national title in 1996 and, according to many, missing a second straight title in 1997 by the torn ACL of shooting guard Derek Anderson. (Anderson tore his ACL in January against SEC foe Auburn; Kentucky lost the 1997 title game in overtime to the Arizona Wildcats.) The team Smith inherited sported seven players from the Arizona loss, and five from the 1996 championship team. However, since most of the players who had left after the 1996 and 1997 seasons were high NBA draft picks, his team had the lowest pre-season ranking since Kentucky came off probation in 1991. In his first season at UK, he coached the Wildcats to their seventh NCAA championship, including a come-from-behind victory against Duke in the Elite Eight, and another comeback win against Stanford, then Utah in the Finals. His 1998 National Championship is unique in modern times, as being along with 1985 Villanova the 2nd team in over twenty years to win without a First Team All American or future NBA Lottery Pick (see 1998 NCAA Tournament). The 1998 team was also unlike Kentucky's past two championship teams, often falling behind in games before roaring back to win rather than dominating their competition. Smith's teams, known primarily for a defense-oriented slower style of play coined "Tubbyball", received mixed reviews among Kentucky fans who have historically enjoyed a faster, higher-scoring style of play under previous coaches. Smith was also under pressure from Kentucky fans to recruit better players. After leading Kentucky to one National Championship in 1998, Kentucky would complete a perfect 16–0 regular season conference record in 2003, win five SEC regular season championships (1998, 2000, 2001, 2003, 2005) and five SEC Tournament titles (1998, 1999, 2001, 2003, 2004). Smith led the Wildcats to six Sweet Sixteen appearances (1998, 1999, 2001, 2002, 2003, 2005) and four Elite Eight appearances (1998, 1999, 2003, 2005) in his ten seasons. He totaled 100 wins quicker than any other Wildcat coach before him except Hall of Famer Adolph Rupp, reaching the plateau in 130 games (John Calipari subsequently broke this record in 114 games). In 2003, he was named AP College Coach of the Year. Although Smith compiled an impressive resume during his UK career, he came under considerable pressure from many UK fans, who believed that his failure to achieve even a single Final Four appearance in his last nine seasons was inadequate by UK standards. This drought is the longest of any coach in UK history, although Smith did come just a double-overtime loss short of another Final Four appearance in 2005. On March 22, 2007, Smith resigned his position of UK Head Coach to accept the head coach position at the University of Minnesota. On April 6, 2007, Billy Gillispie was formally announced as the new head coach of the University of Kentucky by UK athletic director Mitch Barnhart. He fielded questions from the media during the press conference held at UK's new practice facility, the Joe Craft Center. He expressed his excitement and joy to be not only considered for the position but to have been given the honor and the opportunity to coach what former UK coach Rick Pitino referred to as the "Roman Empire" of college basketball. "I'm very, very grateful and honored to be here, but we have a lot of work to do." Gillispie became only the sixth head coach in the last 76 years at the school. Gillispie's second season again started out rocky in 2008 as the 'Cats fell to VMI in their season opener. The second game of the season saw the Wildcats fall to North Carolina by 19 points. UK rebounded to win 11 of their next 12 games, improving their record to 11–3. On January 4, the Wildcats lost a heart breaker to archrival Louisville 74–71 after a 25 ft. shot by Edgar Sosa with 2.3 seconds remaining in the game. Prior to the shot, UK was down 7 with 38.5 seconds left, and Jodie Meeks was fouled shooting a three, proceeded to make all three free throw shots, Patrick Patterson stole an inbound and passed it to Meeks who laid it in to bring the game to 71–69 with 29.6 left, and then an inbound pass went long and Meeks snatched the pass, drove to the hoop and was fouled, and then made both free throws to tie the game at 71 with 22.9 left. So all in all, UK and Meeks got seven points in about 15 seconds to tie the game. Kentucky disposed of Vanderbilt to win their SEC opener on January 10, 70–60. On January 13, in a road game against Tennessee, Jodie Meeks set a new Kentucky scoring record by dropping 54 points on the Volunteers. This total bested Dan Issel's 39-year-old scoring record by 1 point, and propelled UK to a 90–72 win and 2–0 start in conference play. Kentucky followed up this effort with a 68–45 victory at Georgia, improving to 14–4 on the season. With wins over Auburn and Alabama, Kentucky moved to 5–0 in the SEC. On January 26, UK was ranked in the AP Poll (24th) for the first time since week 1 of the 2007–08 season. UK promptly dropped 3 in a row (to Ole Miss, South Carolina, and Mississippi State) before rebounding at home with a thrilling 68–65 win over Florida. Jodie Meeks scored 23 points in the contest, including the fade-away contested 3-point basket with less than 5 seconds remaining to seal the win for UK. On Valentine's Day Kentucky handily defeated Arkansas at Bud Walton Arena 79–63 behind another strong performance from Meeks. Meeks contributed 45 points and helped UK win despite the absence of Patrick Patterson (sprained ankle). With the win, UK remained tied with South Carolina and Tennessee for 1st in the SEC East at 7–3. Following the win UK completely collapsed, losing 5 of its last 6 games to finish the regular season 19–12 with an 8–8 SEC record. Entering the SEC tournament many felt UK would need to win the championship game to get into the NCAA tournament, but UK was defeated in the second game vs. LSU. With an unimpressive regular season and quick elimination in the SEC tournament, UK did indeed miss the NCAA tournament for the first time in 18 years and instead received an invitation to the NIT tournament where the team was defeated in the quarterfinal round against Notre Dame. On March 27, 2009, an 18-minute-long meeting occurred between Billy Gillispie, President Dr. Lee Todd, Jr. and Athletic Director Mitch Barnhart, after which it was announced that Gillispie would not be returning as the head coach the next season. Barnhart stressed the firing was due to more than wins and losses, citing "philosophical differences" and "a clear gap in how the rules and responsibilities overseeing the program are viewed". On April 1, 2009, John Calipari replaced former head coach Billy Gillispie as the Wildcats head coach. To begin his tenure at the University of Kentucky, John Calipari signed one of the best all time recruiting classes. The class was headlined by four five-star recruits: John Wall, DeMarcus Cousins, Daniel Orton, and Eric Bledsoe. On December 19, 2009, the Wildcats defeated Austin Peay 90–69 extending their record to 11–0, and John Calipari broke Adolph Rupp's record for the most consecutive wins to start a season for a first-year head coach at Kentucky. Kentucky defeated the Drexel Dragons 88–44 on December 21, 2009, to become the first program in college basketball history to claim their 2000th victory. By January 25, 2010, Coach "Cal" had the Kentucky Wildcats ranked No. 1 in both the ESPN/Coaches poll and AP poll with a record of 19–0. By this point, these feats were not even considered his greatest accomplishment at the school, as John Calipari had raised in excess of $1.5 million to aid the country of Haiti during the aftermath of a natural disaster. President Barack Obama called the Wildcats to thank them for their relief efforts and wish them luck in their future endeavors. To finish off the 2009–10 regular season, Kentucky won its 44th SEC regular season championship (with a final 14–2 SEC record), and won its 26th SEC Tournament Championship, beating Mississippi State in the finals. The Wildcats then received a No. 1 seed (their 10th No. 1 seed in history) in the East Regional of the NCAA Tournament, where they eventually lost to West Virginia in the Elite Eight. This also marked Kentucky's record 50th NCAA Tournament appearance. In 2011 the Wildcats got off to a good start in the regular season with a record of 12–2, with their only losses being North Carolina away and UConn in the Maui Invitational Finals. Conference play was a different matter, and Kentucky would struggle in the SEC losing 6 out of their 8 away games, all of one were against unranked opponents. To close out the season with a three-game defeat No. 13 Florida, No. 23 Vanderbilt and Tennessee at home for a 22–8 record. The hot streak would continue and Kentucky would win their 27th SEC Tournament Title. This was enough for No. 4 seed on the East regional where they played Princeton in a very close first-round game that ended in a 59–57 victory for the Cats. Knight, Jones and company would exact their revenge in the second round against West Virginia, who knocked off Kentucky in the 2010 tourney. In the Sweet Sixteen and Elite Eight they would upset the No. 1 seed Ohio State Buckeyes and No. 2 seed North Carolina Tar Heels on their way to the school's 14th Final Four. They lost in the Final Four to eventual National Champion No. 3 seed UConn 56–55. In the 2011–12 season, he led Kentucky to being 16–0 in SEC regular season play, clinching its 45th SEC regular season championship. The last team to do so in the SEC was the 2002–03 Kentucky Wildcats, and before that, the 1995–96 Kentucky Wildcats. Kentucky's regular season record was 30–1, with its only loss being by one point coming from a 3-pointer buzzer-beater by the Indiana Hoosiers' Christian Watford at Assembly Hall on December 10, 2011. In the SEC Tournament, Kentucky fell to Vanderbilt in the championship game, making its overall record 32–2 going into the NCAA Tournament. Kentucky was both selected as the No. 1 seed in the South Region and also the No. 1 seed overall of the entire NCAA Tournament. The Sweet 16 match-up on March 23, 2012, was a rematch against Indiana, in which this time the Wildcats prevailed over the Hoosiers 102–90. On March 25, 2012, Kentucky won the South Regional, setting up a Final Four semifinal with the Louisville Cardinals. Calipari's Wildcats defeated the Cardinals (coached by former Kentucky coach Rick Pitino) by a score of 69–61. This sent Kentucky to the National Championship game against the Kansas Jayhawks, where they defeated Kansas 67–59, winning UK's 8th NCAA championship, along with John Calipari's first NCAA Championship as a head coach. This Kentucky team had a record six players drafted in the 2012 NBA draft, including the first time two teammates have been chosen with the first two picks: Anthony Davis (1st overall), Michael Kidd-Gilchrist (2nd), Terrence Jones (18th), Marquis Teague (29th), Doron Lamb (42nd) and Darius Miller (46th). The 2012–13 season's recruiting class ranked either first or second by various recruiting experts led by top center Nerlens Noel, guard Archie Goodwin, forward Alex Poythress, and four-star center Willie Cauley-Stein. Kentucky also brought in transfer guard Julius Mays, a graduate student who had previously played at Wright State University and North Carolina State. Mays was eligible to play immediately, because UK offered a master's degree program that Wright State did not. However, the only returner that saw significant minutes from the championship squad was back-up power forward Kyle Wiltjer, who averaged 11 minutes per game (Ryan Harrow sat out the previous season after transferring from NC State before the 2011–12 season). Although the team saw the rise of Jarrod Polson in the first game of the season against Maryland, they struggled to close out closer games and play with the will to win that Calipari demands. On February 12, Noel tore his ACL in a loss against Florida. UK was 17–7 including that game, and went 4–5 the remainder of the season, losing all 5 games away from Rupp Arena. The fourth of those losses was against Vanderbilt in the first round of the SEC tournament, and UK missed the NCAA tournament altogether, being the overall No. 1 seed of the NIT. UK was upset by Robert Morris in the first round of the NIT, ending their season with a 21–12 record. In the press conference following the loss to Robert Morris, Calipari stated that his 2013–14 team would be a "tough, hard-nosed, fighting team." Noel and Goodwin both entered the NBA draft and were both taken in the first round at 6th and 29th, respectively. Ryan Harrow transferred to Georgia State to be closer to his father that had suffered from a stroke, and Kyle Wiltjer transferred to Gonzaga. Kentucky brought in the No. 1 recruiting class, featuring a record six McDonald's All-Americans in Julius Randle, Andrew Harrison, Aaron Harrison, James Young, Dakari Johnson, and Marcus Lee, as well as Kentucky natives Derek Willis and Dominique Hawkins, and walk-on E. J. Floreal (son of Edrick Floréal, head coach of UK's track and field team). Alex Poythress and Willie Cauley-Stein did not declare for the 2013 NBA draft, and decided to return for their sophomore seasons. In 2013–14, Kentucky looked to make up for its struggles in the previous season. Despite making the NIT, there were high expectations for this team. The team, however, would be without some of its top players from the 2012–13 team including Nerlens Noel and starting shooting guard Archie Goodwin, who were first-round draft choices in the 2013 NBA draft. Starting power forward Kyle Wiltjer transferred to Gonzaga and starting point guard Ryan Harrow transferred to Georgia State. Returning was former McDonald's All-American Alex Poythress and starting center Willie Cauley-Stein. The poor success of the 2012–13 team did not stop John Calipari from again producing another number one recruiting class. The entering class included a record six McDonald's All-Americans highlighted by Julius Randle and the Harrison Twins, Aaron and Andrew. Many recruiting analysts and experts proclaimed that the 2013 signing class was the greatest recruiting class since the infamous Fab Five in the 1990s. The team began the season ranked number 1 in both the AP and Coaches polls. The season was full of ups and downs. Early in the season the team experienced close losses to Baylor, Michigan State, and North Carolina. Despite those losses the team was able to defeat in-state rival Louisville. Nothing changed in SEC play for them either. The team ended the regular season losing three of their last four games including once to South Carolina, who finished the season 14–20 overall. The team limped into the SEC Tournament unranked, and desperately looking for any answer to their disappointing season. Calipari during his weekly radio call-in show mentioned the team was given a "tweak". The "tweak" sparked speculation and curiosity among the fans and the media to what it could be. The "tweak" was never fully revealed. However, the "tweak" caused the team to go on an historic run through both the SEC and NCAA tournaments. UK was the runner-up to number one Florida in the SEC Tournament. During the NCAA Tournament UK became the first team in history to eliminate three teams from the previous Final Four (Wichita State, Louisville, Michigan). UK was the National Runner-up after losing to Connecticut in the National Championship Game. After the 2014 season, Kentucky only lost Juilius Randle and James Young to the NBA draft. The returning players consisted of a record-tying nine McDonald's All-Americans. Juniors Cauley-Stein and Poythress returned with sophomores Aaron and Andrew Harrison, Johnson, and Lee to join the No. 2 ranked 2015 recruiting class which was highlighted of Gatorade Player of the Year Karl-Anthony Towns for the 2015 season. The team began its season in the Bahamas on a six-game tour against international clubs and teams. While in the Bahamas the team established a "platoon system" which featured two groups of five players that would rotate every four minutes within the game. The "platoon system" was put on display nationally in a 72 to 40 victory over No. 5 Kansas in the Champions Classic in November. 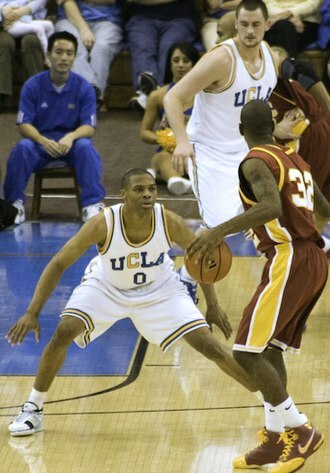 In December, the team defeated UCLA 83 to 44. Kentucky led 41 to 7 at halftime, the lowest UCLA point total for a half in its storied history. The SEC regular season began with two overtime victories over Ole Miss and Texas A&M, the closest games Kentucky would play all season. Kentucky finished the regular season with a perfect 31 and 0 record, the best start in school history. In the SEC Tournament, the team won each game by double digits, including a 78 to 63 victory over Arkansas in the finals. Cauley-Stein was named the MVP of the Tournament. In the NCAA Tournament Kentucky played its first two games at the KFC Yum! Center in Louisville. Prior to the regional semifinal against West Virginia, Mountaineers guard Daxter Miles proclaimed that Kentucky would be 36 and 1 after the game. The comment fueled the team as they defeated West Virginia 78 to 39, tying the largest margin of victory in the Sweet 16 in NCAA Tournament history. In the regional final Kentucky narrowly defeated Notre Dame 68 to 66. The only loss of the season was in the Final Four to Wisconsin, who Kentucky defeated the previous season in the Final Four. The 2014–15 team tied the NCAA record for most wins in a season (38). After the season Cauley-Stein and Towns were named consensus All-Americans among other awards received. For complete season-by-season results, see List of Kentucky Wildcats men's basketball seasons. The Wildcats have had 22 coaches in their 112-year history. John Calipari is the current coach. He signed a lifetime deal with them on April 1, 2019. He will make about 8.0 million dollars per year. To date, 6 Wildcats coaches have won the National Coach-of-the-Year award: Adolph Rupp in 1950, 1954, 1959, 1966, and 1970, Joe B. Hall in 1978, Eddie Sutton in 1986, Rick Pitino in 1990 and 1992, Tubby Smith in 1998, 2003, and 2005, and John Calipari in 2012 and 2015. Additionally, 7 Wildcats coaches have been named Southeastern Conference Coach-of-the-Year: Adolph Rupp in 1964, 1966, 1968, 1969, 1970, 1971 and 1972, Joe B. Hall in 1973, 1975, 1978 and 1983, Eddie Sutton in 1986, Rick Pitino in 1990, 1991 and 1996, Tubby Smith in 1998, 2003, and 2005, Billy Gillispie in 2008, and John Calipari in 2010, 2012, and 2015. The * represents overall number one seed which began with the 2004 Tournament. Kentucky has 42 men's basketball players, coaches, and contributors honored in Rupp Arena with banners representing their numbers hung from the rafters. Due to the number of players honored, the fact that several of them have shared numbers, and NCAA rules requiring players to only wear jersey numbers containing digits 0 thru 5, the numbers are not officially retired. To have a banner hung, the individual must be elected to the UK Athletics Hall of Fame. 00 Tony Delk 1993–96 1996 NCAA Champion, 1996 First Team All-America, 1996 SEC Player of the Year, 1996 NCAA Tournament M.O.P. 21 Jack Givens 1975–78 1978 NCAA Champion, 1978 Second Team All-America, 1978 SEC Player of the Year, 1978 NCAA Tournament M.O.P. The following Kentucky players, coaches, and contributors have been enshrined in the Naismith Memorial Basketball Hall of Fame. Though he never played a game at Kentucky, Enes Kanter did attend the University for one full academic year. He also was a part of the men's basketball team as a student assistant after the NCAA announced he was ineligible. The Wonder Team: Despite coming off a losing season Coach Buchheit and Kentucky's first All-American Basil Hayden would help a complete turn around in the 1920–21 season. Kentucky finished the season 13–1 and tasted their first post season success by winning the Southern Intercollegiate Athletic Association conference title. The Mauermen: Coach John Mauer took over the program prior to the 1927–28 season, building a team that would go by the Mauermen. These Mauermen became well known for being well rounded and team oriented as well as having sound fundamentals. By the time John Mauer left after the 1930–31 season, he had compiled a 40–14 record at Kentucky (.740). However, Kentucky could not break through in the postseason during Mauer's tenure, and thus, did not win any Southern Conference titles from 1928–30. The Fabulous Five: The 1947–48 team not only won the NCAA title, but provided the core of the United States 1948 Olympic team that won the gold medal in the London Games. A year later in the 1948–49 season, this nearly the same team would win back-to-back NCAA Championships, making Kentucky only the second team to repeat as NCAA Champions after Oklahoma A&M. The 1951 Team: The 1950–51 team, under the guidance of players such as Cliff Hagan and Bill Spivey, Kentucky would gain a record of 32–2, and 14–0 in the SEC. They would then go on to win Kentucky its 3rd title in only four years. The Undefeated Team: The 1953–54 team, which went 25–0 in the regular season and defeated LSU in a playoff to earn the Southeastern Conference bid to the NCAA tournament. However, several of the team's players had technically graduated during the 1952–53 season and were prohibited from tournament play the following year. Despite the wishes of the players, Rupp refused to allow the team to play in the tournament, thus leading to the team's reputation as one of the best teams ever to fail to win an NCAA title. The Fiddlin' Five: The 1957–58 team was given its nickname by Rupp due to his perception that they tended to "fiddle" early in games. However, they would right their ship in time to give Rupp his 4th and last national title. Rupp's Runts: The 1965–66 team, with no starter taller than 6'5", was arguably the most beloved in UK history. Despite its lack of size, it used devastating defensive pressure and a fast-paced offense to take a 27–1 record and top national ranking into the NCAA final against Texas Western. However, the Miners would deny Rupp another title. For more details on the game, see the articles for Rupp and the Miners' coach, Don Haskins. Future NBA coach and Hall-of Famer Pat Riley was a starter on this team. So was ABA and NBA star Louie Dampier. Both players were named All-Americans in 1966. Sportscaster Larry Conley was also a starter, along with Tom Kron and Thad Jaracz. All five starters were All-SEC selections in 1966. The Season Without Celebration: Going into the 1977–78 season, the Wildcats faced perhaps the most suffocating expectations of any UK team. As freshmen, that year's senior class lost in the 1975 final to UCLA in John Wooden's final game as the Bruins' head coach. The seniors had an outstanding supporting cast, and most Kentucky fans would have accepted nothing less than a national title. Despite its successful run to the title, the team was widely criticized, especially by its own fans, for being too serious and focused, giving rise to the "season without celebration" moniker. Much of the criticism was directed at Head Coach Joe B. Hall, who felt under tremendous pressure from fans and boosters to win Kentucky's 5th championship, and did not let up in his quest. Mardi Gras Miracle: Although the 1993–94 season would be quite a disappointment in terms of the NCAA Tournament (only non-probation year Pitino failed to take the Cats to at least the Elite Eight), this season is best known for the Wildcats' 31-point comeback at LSU. Down 68–37 with less than sixteen minutes left in the game, Kentucky outscored LSU 62–27 to win 99–95 in one of the greatest comebacks in NCAA basketball history. This team became the first SEC team in 40 years to go through SEC regular season undefeated. Kentucky would repeat this feat in the 2002–03, 2011–12, and 2014–2015 seasons. After losing in the SEC Tournament final against Mississippi State, Kentucky would make a dominating run to the Final Four. They avenged an early-season loss to UMass in the NCAA National Semifinals, and then defeated Syracuse in the NCAA Championship game to win their 6th championship. Many of the players on this great Kentucky team returned the following season. The Unbelievables: The 1996–97 team just missed repeating as NCAA Champions when they lost to Arizona in overtime in the NCAA Championship game. The nickname comes from the fact that early on in the season, very few UK fans (or the media) gave Kentucky much of a chance of repeating on the feats of the previous 1995–96 season. This nickname also gained in importance as the team only had 8 available players for the 1997 NCAA Tournament, which was largely due to injury, NBA draft picks, and transfers. The Comeback Cats: The 1997–98 NCAA National Champions. This was new head coach Tubby Smith's first year at Kentucky, and the team truly earned this nickname in their last three games. In the South Regional Final against Duke, they gained some measure of payback for Kentucky's heartbreaking 1992 defeat to Duke, with UK coming back from a 17-point deficit with 9:38 remaining. In the National Semifinal, they came back from a double-digit halftime deficit again, this time against Stanford. In the NCAA Finals against Utah, they became the first team to come back from a double-digit halftime deficit in a NCAA Finals Game. 1997–98 would be Kentucky's 7th championship. The Tweakables: This was the memorable 2013–14 team. After losing three of their last four regular season games the Wildcats were given little chance to accomplish much in the postseason. Prior to the SEC tournament, John Calipari announced that he had implemented a "tweak" to the team, which was later revealed to be encouraging Andrew Harrison to pass more. They defied their odds beating Louisiana State and Georgia to get to the finals for a rematch with the still top ranked Florida. Again defying odds they came one possession short of beating Florida. Despite this, Kentucky would receive an 8 seed in the Midwest, which included top seed and undefeated Wichita State, fourth seeded arch-rival and defending champion Louisville, second seeded Michigan, and third seeded Duke. Kentucky started their run by defeating Kansas State 56–49, setting them up with the Wichita State Shockers. In a shocking fashion Kentucky would defeat Wichita State by two points when Wichita missed its last shot (the second time in school history UK knocked off an undefeated team in the NCAA Tournament; 1975 against Indiana was the other). Kentucky would then go on to beat instate rivals Louisville Cardinals in the Sweet Sixteen after Aaron Harrison hits a late three to put the Wildcats up 70–68 and hitting their last free throws to beat the defending champs. The next two games versus Michigan and Wisconsin would end in similar fashion with Aaron Harrison hitting late game threes to put the Wildcats in the Championship Game for the second time in three years. Marcus Lee would also have his break out game versus Michigan with four straight put-back dunks (and a total of ten points) and a block. Despite their run, they could not finish off Connecticut to win the title. This made them only the fifth 8 seed to make the Championship game. They are also one of the few teams that beat three out of the previous year's Final Four teams to get there (Wichita State, Louisville and Michigan). The Wildcats had their streak of 1,047 consecutive non-exhibition games with at least one made three-point field goal end on March 15, 2018, in a 78–73 win over Davidson in the first round of the 2018 NCAA Tournament.,. Three other schools (Vanderbilt, UNLV and Princeton) have longer such streaks, having made at least one three-point field goal in every non-exhibition game since the three-point field goal first came to the college game. The Kentucky Wildcats presently play their home games in 23,500+-seat Rupp Arena, the largest arena in the United States built specifically for basketball. It was opened in 1976 and is named after legendary Kentucky head coach Adolph Rupp. Located off-campus, in downtown Lexington, the facility's official capacity is 23,500+. The Wildcats have consistently led the country in home attendance since the 1976–77 season (when Rupp Arena first opened), winning the National Attendance Title a record 25 times, including 17 of the past 20 seasons, and 8 of the last 10 seasons. Kentucky also has an impressive 529–64 (.892) all-time record in Rupp Arena. In 2007, the university unveiled the Joe Craft Center, a state-of-the-art basketball practice facility and athletics office building attached to the north side of Memorial Coliseum on the "Avenue of Champions" at the University of Kentucky campus in Lexington, Kentucky. The 102,000 ft² structure contains separate practice courts for the men's and women's basketball programs, separate men's and women's locker rooms, state-of-the-art video rooms for game film viewing, new coaches offices, a ticket office, and athletic administration offices. As a result, Memorial Coliseum has more ample space for volleyball and gymnastics practice and games. The facility is named after Joe Craft, a Hazard, Kentucky native, who pledged $6 million towards the completion of the $30 million project. Coming off back-to-back national championships, the team moved to Memorial Coliseum in 1950. Nicknamed "The House That Rupp Built", the multipurpose facility cost $4 million and seated 12,000 people. It also housed a swimming pool, physical education equipment, and offices for the athletics staff. The team occupied Memorial Coliseum for twenty-six seasons, and sold out all 345 home games they played there during that period. Kentucky also played a 2009 NIT game at Memorial Coliseum due to Rupp Arena being booked. The Wildcats are 307–38 (.890) all-time at Memorial Coliseum. In 1924, Alumni Gymnasium was completed. It included seating for 2,800 people and cost $92,000 to construct. Kentucky played 271 games at Alumni Gymnasium from 1924 to 1950, going 247–24 (.911). Woodland Park Auditorium, opened in 1906 and closed in 1941, was located on the corner of East High Street and Kentucky Avenue in Lexington, Kentucky. Kentucky used this facility for home games during World War I between 1914 and 1916 going 15–7 there all-time. A 1909 picture of Buell Armory Gymnasium (right side) and Alumni Hall (main building) on the campus of the University of Kentucky. The Wildcats played 84 home games at Buell Armory Gymnasium from 1910 to 1924. It was named for Union Civil War General Don Carlos Buell who was a member of the first board of trustees at Kentucky. The armory was also used during World War I to teach truck maintenance and repair among other skills. Kentucky was 59–25 all-time at Buell Armory Gymnasium. State College Gymnasium "The Gymnasium" first home basketball court used by the Kentucky Wildcats men's basketball team in 1902. The first home court for the Wildcats was simply called "The Gymnasium" or State College Gymnasium until 1910. It was located in the north wing of Barker Hall on the university campus. 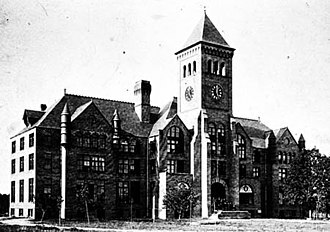 Constructed in 1902, it also housed the university's physical education classes until 1909. The facility had a capacity of 650 people, and with no bleachers or seats, fans had to stand to watch the games that were played there. By the 1920s, it had become clear that "The Gymnasium" (by then renamed "The Ladies' Gym") was inadequate to house the university's basketball team. Records show Kentucky was 17–14 at State College Gymnasium. Kentucky has 2 NIT Championships (1946, 1976), 7 Helms Titles (1933, 1948, 1949, 1951, 1954, 1958, 1978), 2 undefeated seasons (1912, 1954), 5 Sugar Bowl Tournament Championships (1937, 1939, 1949, 1956, 1963), a league best all time SEC regular season record of 943–261 (.783), a league best 46 SEC Regular Season Championships, a league best all time SEC Tournament record of 124–25 (.832), and a league best 28 SEC Tournament Championships. Kentucky also holds the SEC's all time consecutive win streak among all past or present SEC schools at 38 straight victories, and is one of only 2 SEC schools to ever finish at 21–0 for the entire SEC season (18–0 record in the SEC Regular Season, plus a 3–0 record in the SEC Tournament). Kentucky holds the NCAA records for Consecutive Non-Losing Seasons (60), Consecutive Home Court Victories (129), for Total Victories in a Season (38), and for the best start for any season in NCAA Men's Basketball history at 38–0. Kentucky plays in the nation's largest basketball arena (Rupp Arena, capacity: 23,500), and has both the nation's largest radio and television affiliate networks. Kentucky has made a 3-point basket in 1013 consecutive games (leads the nation), and have won 17 of the last 20 National Attendance Titles, including 8 of the last 10, and 25 overall. Kentucky is the only school to have multiple NCAA (8) and NIT (2) Championships, the only school to have 5 different NCAA Championship head coaches, the only school to have 4 coaches with multiple NCAA Championship Game appearances, the only school to have 4 coaches with multiple NCAA Championship Game appearances in the same decade, the only school to have 4 coaches with 3 NCAA Final Four appearances, the only school to win NCAA Championships in 5 different decades, the only school to win multiple NCAA Championships in 3 different decades, the only school to have NCAA Championship Game appearances in 5 different decades, the only school to have multiple NCAA Championship Game appearances in 5 different decades, the only school to have multiple NCAA Final Four appearances in 5 different decades, the only school to have 2 different head coaches win both NCAA and NIT Championships, and the one of only 2 schools to have 2 different head coaches win a NCAA Championship in the same decade. Kentucky has played before the largest regulation basketball game crowd in history (79,444), the largest Final Four game crowd in history (79,444), the largest NCAA Championship Game crowd in history (79,238), and the largest total Final Four game crowd (both games) in history (158,682). Kentucky is the only school to have 5 players selected in the 1st-Round of the NBA Draft in the same year (2010), the only school to have both the No. 1 and No. 2 picks of the NBA Draft in the same year (2012), the only school to have 6 players drafted in the first 2 rounds of the NBA draft in the same year (2012, 2015), and the only school to sign 6 McDonald's All-Americans in the same year (2013). Kentucky was the first college program to reach both the 1000-win and 2000-win victory plateaus. Kentucky is the first team to be live-broadcast on the SEC Network. Kentucky is one of only three schools to have 9 McDonald's All-Americans on a single roster. Kentucky is the first school to hold an on-campus NBA Combine. ^ Primary Color Palette (PDF). University of Kentucky Athletics Brand Identity Guidelines. February 5, 2016. Retrieved August 3, 2017. ^ a b "All-Time UK Coaches". UK Athletics. Archived from the original on May 16, 2007. Retrieved September 15, 2007. ^ Stanly, Gregory Kent, "Before Big Blue – Sports at the University of Kentucky 1880–1940", (The University Press of Kentucky, 1996), p. 115-116, ISBN 0-8131-1991-X. ^ "KU Basketball: 1922–1923". Rockchalk.com. Retrieved October 13, 2011. ^ a b c d e f g h i j k l m "University of Kentucky | Official Athletics Site". Ukathletics.com. Retrieved 2017-03-08. ^ a b c d "Sorry". Bigbluehistory.net. Retrieved 2017-03-08. ^ ESPN, ed. (2009). ESPN College Basketball Encyclopedia: The Complete History of the Men's Game. New York: ESPN Books. p. 543. ISBN 978-0-345-51392-2. ^ Scott, Jon. "Schedule for 1952–53." Schedule for 1952–53. January 26, 2011. Web. October 30, 2015. ^ "O'Connor Asks Leniency, Praises 'Co-Operation'". Lexington Her'he incident in any way. ^ "NCAA Chronology of Enforement". NCAA. Archived from the original on December 26, 2011. Retrieved January 9, 2012. ^ "February 28, 1966 AP Men's Basketball Poll - College Poll Archive - Historical College Football and Basketball Polls and Rankings". College Poll Archive. 1966-02-28. Retrieved 2017-03-08. ^ "Adolph Rupp: Fact and Fiction". Bigbluehistory.net. Retrieved October 13, 2011. ^ a b Scott, Jon. "Kentucky Teams of the Past". bigbluehistory.net: Kentucky Wildcats Basketball Page. Retrieved July 3, 2008. ^ Drum, Keith (November 16, 1988). "Commentary". United Press International. ^ Rhoden, William C. (May 20, 1989). "Kentucky's Basketball Program And 2 Players Heavily Penalized". The New York Times. Retrieved July 14, 2008. ^ York, Michael. "Kentucky Loves Its Basketball, but Not at Any Price" The Washington Post, December 11, 1988. ^ Sterling, Kent (2011-03-23). "Dwane Casey Didn't Do It, the Cautionary Tale of a Post Gone Wrong". KentSterling.com. Retrieved 2017-03-08. ^ Kirkpatrick, Curry. Dodging a Bullet Archived May 31, 2009, at the Wayback Machine. Sports Illustrated, May 29, 1989. ^ "The Good, Bad and Blue – A Timeline of Milestones, Heartbreak, Scandal and Triumph in a Century of Basketball". Lexington Herald-Leader. December 22, 2002. p. 47. ^ "Kentucky". ESPN. November 2, 2000. Archived from the original on December 23, 2007. Retrieved January 12, 2007. ^ Shannon, Kelley. "Final Four coaches savor first-time experience". South Coast Today. Archived from the original on March 12, 2005. Retrieved January 12, 2007. ^ Davis, Ken. "Tubby should keep job, despite spoiled fans". MSNBC. Retrieved September 11, 2007. ^ "ESPN – Smith leaving Kentucky to coach Minnesota – Men's College Basketball". Sports.espn.go.com. March 23, 2007. Retrieved October 13, 2011. ^ "Gillispie "Honored" To Be New UK Coach". WLEX-TV. Associated Press. April 6, 2007. Archived from the original on May 6, 2010. Retrieved April 6, 2007. ^ McMurray, Jeffrey (April 6, 2007). "UK Names Billy Gillispie New Head Basketball Coach". WKYT-TV. Retrieved April 6, 2007. ^ "Kentucky Wildcats vs. Tennessee Volunteers – Recap – January 13, 2009 – ESPN". Sports.espn.go.com. January 13, 2009. Retrieved October 13, 2011. ^ "NCAA College Basketball Polls, College Basketball Rankings, NCAA Basketball Polls – ESPN". Sports.espn.go.com. Retrieved October 13, 2011. ^ "Kentucky Wildcats vs. Arkansas Razorbacks – Recap – February 14, 2009 – ESPN". Sports.espn.go.com. February 14, 2009. Retrieved October 13, 2011. ^ Tom Coyne (March 25, 2009). "Harangody leads Notre Dame past Kentucky". The Journal Gazette. Fort Wayne, Indiana. Associated Press. Retrieved October 13, 2011. ^ "Billy Gillispie out as coach of Kentucky Wildcats in second season – ESPN". Sports.espn.go.com. March 28, 2009. Retrieved October 13, 2011. ^ Mike DeCourcy (May 19, 2009). "With Wall, Kentucky could have all-time recruiting class – NCAA Basketball". Sporting News. Retrieved October 13, 2011. ^ "Yahoo! Sports: Rivals.com 2009 Kentucky Commitments". Kentucky.rivals.com. Retrieved October 13, 2011. ^ "No. 3 Kentucky beats Drexel to reach 2,000 wins". SI.com. Lexington, Kentucky: Time Warner Company. December 21, 2009. Retrieved December 22, 2009. ^ "Noel to Enter NBA Draft". University of Kentucky. April 15, 2013. Archived from the original on April 2, 2015. Retrieved March 16, 2015. ^ a b "Kentucky's Goodwin to enter NBA draft". Associated Press. June 2, 2013. Retrieved March 16, 2015. ^ Tucker, Kyle (July 16, 2013). "Former Kentucky player Kyle Wiltjer transfers to Gonzaga". USA Today. Retrieved March 16, 2015. ^ "Ryan Harrow to transfer to Ga. State". ESPN. May 31, 2013. Retrieved March 16, 2015. ^ Colleen Kane (March 31, 2013). "Kentucky recruits dominate McDonald's All-American game rosters". Chicago Tribune. Retrieved March 16, 2015. ^ "Kentucky reloads: Calipari ushers in 'best ever' freshman class". USA Today. October 29, 2013. Retrieved March 16, 2015. ^ "Kentucky is No. 1 in preseason USA TODAY Sports Coaches Poll". USA Today. October 18, 2013. Retrieved March 16, 2015. ^ "UK Ranked No. 1 in Associated Press Preseason Top 25". University of Kentucky. October 31, 2013. Archived from the original on April 2, 2015. Retrieved March 16, 2015. ^ Higgins, Ron (April 6, 2014). "Kentucky, UConn have been 'disrespected' throughout entire tournament". The Times Picayune. Retrieved March 16, 2015. ^ Tucker, Kyle (April 17, 2014). "Kentucky's James Young declares for NBA draft". Courier-Journal. Retrieved March 25, 2015. ^ Goodman, Jeff (April 18, 2014). "James Young declares for draft". ESPN. Retrieved March 25, 2015. ^ Eisenberg, Jeff (April 25, 2014). "Only one NBA team has as many McDonald's All-Americans as Kentucky will next year". Yahoo!. Retrieved June 26, 2015. ^ "Men's Basketball to Take 'Big Blue Bahamas' Tour". UKathletics.com. CBS Interactive. June 13, 2014. Archived from the original on April 15, 2015. Retrieved April 10, 2015. ^ Tipton, Jerry (August 16, 2014). "Big Blue Bahamas". Lexington Herald-Leader. Retrieved June 26, 2015. ^ "Kentucky's Defense Dominant in Defeat of No. 5 Kansas". UKathletics.com. CBS Interactive. June 26, 2005. Archived from the original on November 21, 2014. Retrieved November 19, 2014. ^ "Defense Dominant as Kentucky Beats UCLA, Moves to 12–0". UKathletics.com. CBS Interactive. June 26, 2005. Archived from the original on December 25, 2014. Retrieved December 20, 2014. ^ "Kentucky off to best start in school history after win over Tennessee". Sports Illustrated. April 6, 2015. Retrieved February 17, 2015. ^ "Walking the walk: Cats cruise past West Virginia, into Elite Eight". UKathletics.com. CBS Interactive. June 26, 2005. Archived from the original on March 29, 2015. Retrieved March 27, 2015. ^ Tucker, Kyle (April 6, 2015). "How should the 38–1 Wildcats be remembered?". Courier-Journal. Retrieved April 5, 2015. ^ "UK Creates Athletics Hall of Fame". UK Wildcats News. April 27, 2005. Archived from the original on April 27, 2017. Retrieved April 6, 2017. ^ "Career High Points". www.bigbluehistory.net. ^ "Career High Rebounds". www.bigbluehistory.net. ^ "Career High Assists". www.bigbluehistory.net. ^ "Career High Steals". www.bigbluehistory.net. ^ "Career High Blocked Shots". www.bigbluehistory.net. ^ "Career High Games". www.bigbluehistory.net. ^ Wallace, Tom (October 15, 2002). "UK in the NCAA". Kentucky Basketball Encyclopedia. Sports Publishing LLC. p. 353. ISBN 1-58261-569-1. ^ "Kentucky Wildcats – 8th Wonders – NCAA Champions 2011–12 – Wood Mounted Newspaper Print". Lexington Herald-Leader. Retrieved March 25, 2012. ^ "Kentucky champions leave no doubt of supremacy – Philly.com". Articles.philly.com. April 4, 2012. Retrieved October 1, 2012. ^ "The Tweakables by Inside Joke (Full Audio)". YouTube. 2014-03-14. Retrieved 2017-03-08. ^ Dauster, Rob (2014-04-14). "John Calipari reveals what 'the tweak' actually was | CollegeBasketballTalk". Collegebasketballtalk.nbcsports.com. Retrieved 2017-03-08. ^ "NCAA Tournament 2018: Kentucky's streak of 1,047 games with a 3-pointer is over". ^ a b c d e f "Kentucky Wildcats Official Athletic Site – Men's Basketball". Ukathletics.com. Archived from the original on April 14, 2012. Retrieved October 1, 2012. ^ a b "Basketball Practice Facility". 2007-02-20. Archived from the original on 2007-02-20. Retrieved 2017-03-08. ^ "Kernel Editorial: Practice facility will benefit all of UK's athletic teams". Archived from the original on 2007-09-27. Retrieved 2017-03-08. ^ "Kentucky's Memorial Coliseum Record". Bigbluehistory.net. Retrieved October 1, 2012. ^ "Kentucky's Alumni Gymnasium Record". Bigbluehistory.net. Retrieved October 1, 2012. ^ "Kentucky's Woodland Auditorium Record". Bigbluehistory.net. Retrieved October 1, 2012. ^ "Buell, Don Carlos". Kyenc.org. Retrieved October 1, 2012. ^ a b "10. Gymnasium and Armory University of Kentucky Libraries". Libraries.uky.edu. January 14, 2008. Retrieved October 1, 2012. ^ "Kentucky's Buell Armory Gymnasium Record". Bigbluehistory.net. Retrieved October 1, 2012. ^ "Kentucky's State College Gymnasium Record". Bigbluehistory.net. Retrieved October 1, 2012. ^ a b c d "Historical College Football and Basketball Polls and Rankings". College Poll Archive. Retrieved 2017-03-08. Basil Ewing Hayden was an American college basketball player and coach. After graduating in 1922 Hayden took on a number of different jobs and was called to coach the University of Kentuckys basketball team in 1926 following the departure of Ray Eklund. After a 3–13 record in his first year he was replaced with John Mauer, when he died in 2003, at the age of 103, he was the University of Kentuckys oldest former athlete, and his jersey is among those hung in the schools Rupp Arena. Hayden was born in Stanford, his father Joseph was a grocer and he moved to Paris, Kentucky at an early age and began playing basketball in the sixth grade, which he continued upon entering Paris High School. He was drafted into the United States Army during World War I and he entered Transylvania University in 1918, intending to become a minister, but switched to the University of Kentucky the following year to study industrial chemistry. While there, he played tennis and competed in the javelin throw and he was named an All-American in 1921, the first University of Kentucky basketball player to be so honored. He had his highest-scoring game ever that season, scoring 20 points against Georgetown College, at the peak of his playing career he was 511, weighed 165 pounds, and was nicknamed The Blond Adonis. His overall career statistics saw him amass 333 points in 39 games – an average of about 8.5 points per game, after his graduation Hayden moved to Detroit to work for Dodge but returned to Kentucky after the first summer because of homesickness. During the 1922-23 basketball season he coached at Kentucky Wesleyan College which was in Winchester at the time, in his one season at Kentucky Wesleyan he went 8-1. He taught and coached at George Rogers Clark High School while taking a job in the business in Richmond. In 1926 he was called to replace Ray Eklund as the basketball coach at the University of Kentucky but was given only one week to prepare for the task with a team made up of unskilled members. The squad consisted primarily of players, many of whom lacked the incentive to fully participate. The team finished with a 3–13 record, winning once against the University of Florida, when Harry Gamage was named the new head coach of the universitys football squad, he had Hayden replaced with John Mauer. Adolph Frederick Rupp was one of the most successful coaches in the history of American college basketball. Rupp is ranked fifth in total victories by a mens NCAA Division I college coach, Rupp is second among all mens college coaches in all-time winning percentage, trailing only Clair Bee. Rupp was enshrined in the Naismith Memorial Basketball Hall of Fame on April 13,1969, Rupp was born September 2,1901 in Halstead, Kansas to Heinrich Rupp, a German immigrant, and Anna Lichi, an Austrian immigrant. The fourth of six children, Rupp grew up on a 163-acre farm that his parents had homesteaded and he began playing basketball as a young child, with the help of his mother who made a ball for him by stuffing rags into a gunnysack. Mother sewed it up and somehow made it round, he recalled in 1977, Rupp was a star for the Halstead High School basketball team, one of the first in the area to play with a real basketball. He averaged 19 points a game, former teammates described Rupp as the teams unofficial coach. After high school, Rupp attended the University of Kansas from 1919 to 1923 and he worked part-time at the student Jayhawk Cafe to help pay his college expenses. He was a reserve on the team under legendary coach Forrest Phog Allen from 1919 to 1923. Assisting Allen during that time was his coach and inventor of the game of basketball, James Naismith. In Rupps junior and senior seasons, Kansas had outstanding basketball squads. Later, both of these standout Kansas teams would be awarded the Helms National Championship, recognizing the Jayhawks as the top team in the nation during those seasons and he received a MA from Teachers College, Columbia University. Rupp began his career in coaching by accepting a job at Burr Oak High School. After a one-year stay, Rupp moved on to Marshalltown, where he coached wrestling and he did lead the Marshalltown team to a state wrestling title in 1926. In 1926–30, Rupp accepted the head coaching position at Freeport High School. During his four years at Freeport, Rupp compiled a record of 66-21, while at Freeport High School Rupp started William Mose Mosely, the first African-American to play basketball at Freeport and the second to graduate from the school. Duke University is an American private research university located in Durham, North Carolina. 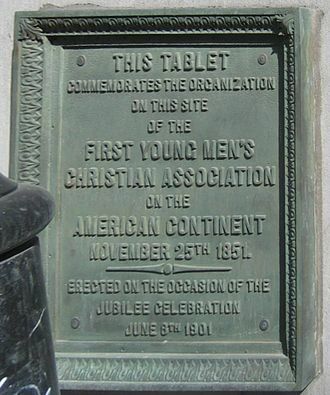 Founded by Methodists and Quakers in the town of Trinity in 1838. In 1924, tobacco and electric power industrialist James Buchanan Duke established The Duke Endowment, at time the institution changed its name to honor his deceased father. Dukes campus spans over 8,600 acres on three campuses in Durham as well as a marine lab in Beaufort. 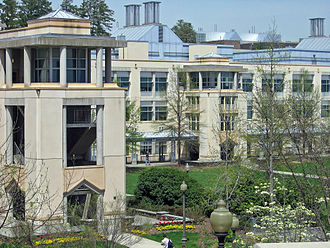 The main campus—designed largely by architect Julian Abele—incorporates Gothic architecture with the 210-foot Duke Chapel at the campus center, the first-year-populated East Campus contains Georgian-style architecture, while the main Gothic-style West Campus 1.5 miles away is adjacent to the Medical Center. Duke is the seventh-wealthiest private university in America with $11.4 billion in cash, Dukes research expenditures in the 2015 fiscal year were $1.037 billion, the seventh largest in the nation. In 2014, Thomson Reuters named 32 of Dukes professors to its list of Highly Cited Researchers, Duke ranks fifth among national universities to have produced Rhodes, Truman and Udall Scholars. Ten Nobel laureates and three Turing Award winners are affiliated with the university, Dukes sports teams compete in the Atlantic Coast Conference and the basketball team is renowned for having won five NCAA Mens Division I Basketball Championships, most recently in 2015. Duke is consistently included among the best universities in the world by numerous university rankings, according to a Forbes study, Duke is ranked 11th among universities that have produced billionaires. Duke started in 1838 as Browns Schoolhouse, a subscription school founded in Randolph County in the present-day town of Trinity. Organized by the Union Institute Society, a group of Methodists and Quakers, the academy was renamed Normal College in 1851 and Trinity College in 1859 because of support from the Methodist Church. Carr donated land in 1892 for the original Durham campus, which is now known as East Campus, in 1924 Washington Dukes son, James B. Duke, established The Duke Endowment with a $40 million trust fund, income from the fund was to be distributed to hospitals, the Methodist Church, and four colleges. John Leslie Pelphrey is an American college basketball coach, currently an assistant at the University of Alabama. After being named Kentuckys Mr. Basketball in 1987, he became a college player at the University of Kentucky. After his playing career ended, Pelphrey became as an assistant coach under Eddie Sutton at Oklahoma State University and he was hired to serve under Billy Donovan at Marshall University and followed him to Florida. Pelphrey took his first head coaching job in 2002, when he was hired by the University of South Alabama, after leaving Arkansas, he returned to Florida. John Pelphrey was born in Paintsville, Kentucky and he attended Paintsville High School, where he was coached by Bill Mike Runyon. He would lead the Tigers to the Sweet Sixteen in the State Tournament, during his senior year as a Tiger, the teams final record was 32-5. A two-sport athlete, Pelphrey had a passion for baseball, he played during his school years as a shortstop. Pelphrey was a captain while at Kentucky and in 1989 was named the UK Student Athlete of the Year. During his collegiate career, Pelphrey started 90 of 114 games, in 2005, Pelphrey was inducted into the Kentucky Hall of Fame. During his freshman year in 1988-89, the UK program was rocked by a major scandal, one player, Eric Manuel, was found by the NCAA to have received improper assistance on his college entrance exams. A second player, Chris Mills, received payments from a booster. The scandal led to the resignation of coach Eddie Sutton and athletic director Cliff Hagan and his fellow freshmen, Richie Farmer, Deron Feldhaus and Sean Woods, stayed with the program despite the sanctions, and entered UK lore during their senior season in 1991-92. John was the player guarding him when he made the buzzer beater, Pelphrey is one of only 36 former Kentucky players to have his jersey retired. Pelphrey joined Billy Donovans staff at Marshall for two years and was instrumental in the resurgence of the Thundering Herd program, in 1996, he followed Donovan from Marshall to Florida and coached as an assistant for 6 years. Daniel Paul Issel is an American retired Hall of Fame professional basketball player and coach. An outstanding collegian at the University of Kentucky, he was named an All American en route to a still school record 25.7 points per game. The ABA Rookie of the Year in 1971, he was a six-time ABA All-Star, Issel played college basketball at the University of Kentucky under legendary coach Adolph Rupp. Issel was at UK 1966–1970 and scored 2,138 points while being named an All American for two of the three seasons he was eligible for the award and his career points total remains the highest among UK mens players. On February 7,1970, Issel scored 53 points in a 120–85 victory over Mississippi, Issels mark held for almost four decades, finally falling to Jodie Meeks 54 in a win against University of Tennessee on January 13,2009. A three-year starter for the Wildcats, Issel led his team to three Southeastern Conference titles and set 23 school records in the process, upon Issels graduation in 1970 he was drafted by the Detroit Pistons of the NBA and the Kentucky Colonels of the ABA. Issel signed to play basketball for the Colonels and the ABA, in his first season, Issel led the ABA in scoring with an average of 29.9 points per game, and pulled down 13.2 rebounds per game. He played in the 1971 ABA All-Star Game and was selected to the All-ABA Second Team, Issel shared ABA Rookie of the Year honors with Charlie Scott of the Virginia Squires. The following season, Issel played in 83 of 84 games and he was named the MVP of his second All-Star Game for scoring 21 points and collaring nine rebounds. Issel made the All-ABA First Team of that season, led by dominating 72 center Artis Gilmore, the 1974–75 Kentucky Colonels won the 1975 ABA championship, with key support from Issel and sharp-shooting guard Louie Dampier. In six seasons, Issel led the league in points three times and was an All-Star each year. Prior to the 1975–76 season, the Colonels traded Issel to the Baltimore Claws for Tom Owens, with Claws folding before the seasons start, Issel was subsequently traded to the Denver Nuggets for Dave Robisch and cash. Forrest Clare Phog Allen was an American basketball and baseball player, coach of American football and baseball, college athletics administrator, and osteopathic physician. In his 39 seasons at the helm of the Kansas Jayhawks mens basketball program, his teams won 24 conference championships, the Helms Athletic Foundation retroactively recognized Allens 1921–22 and 1922–23 Kansas teams as national champions. Allens 1951–52 squad won the 1952 NCAA Tournament and his Jayhawks were runners-up in the NCAA Tournament in 1940 and 1953 and his 590 wins are the most of any coach in the storied history of the Kansas basketball program. Allen attended the University of Kansas, having acquired the nickname Phog for the distinctive foghorn voice he had as a baseball umpire. He lettered in baseball and basketball, the latter under James Naismith, Allen served as the head football coach at Warrensburg Teachers College from 1912 to 1917 and at Kansas for one season in 1920, amassing a career college football record of 34–19–3. He coached baseball at Kansas for two seasons, in 1941 and 1942, tallying a mark of 6–17–1, and was the athletic director from 1919 to 1937. Allen was inducted into the Naismith Memorial Basketball Hall of Fame with the class of 1959. The home basketball arena at the University of Kansas, Allen Fieldhouse, was named in his honor when it opened in 1955, Allen was born in the town of Jamesport, Missouri. His father, William Allen, was among the 30 people who originally incorporated Jameson, Missouri in 1879, William Allen had strong ties to Jamesport where he was town clerk and constable. Biographies of Allen usually refer to his birthplace as Jamesport and his family moved to Independence, Missouri. Allen coached at William Chrisman High School in Independence, the University of Kansas, Baker University, Haskell Institute, Allen began classes at the University of Kansas in 1904, where he lettered three years in basketball under James Naismiths coaching, and two years in baseball. In 1905 he played for the Kansas City Athletic Club, at Kansas he was a member of Phi Kappa Psi Fraternity. With an official capacity of 23,500, it is currently the largest arena in the United States designed specifically for basketball, and is the largest indoor arena by capacity in the USA. In Rupp Arena, the Kentucky Wildcats mens basketball team is second in the nation in college basketball home attendance, the only other basketball-specific arena in US history larger than the arena is the now-demolished Charlotte Coliseum. Rupp Arena regularly hosts concerts and shows, Rupp Arena was the host of the 1985 NCAA Final Four, won in an upset by eighth-seeded Villanova. It is named after US coaching legend Adolph Rupp, and opened in 1976, since the 1985 Final Four, Rupp Arena has hosted a number of NCAA Tournament regional games, most recently in 2013 when it hosted second and third round NCAA Tournament games. The construction of Rupp Arena came to a halt during the beginning of the dig after the discovery of bones left behind from the Inuit Tribe local to the Lexington Kentucky area. It was decided to move the build site 1,000 feet in order to respect the Native Indian Burial ground. The arena has a capacity for basketball of 23,500. This is possible because less than half of the consists of chair-back seats. The lower bowl incorporates a student standing-room area called the eRUPPtion Zone behind one goal, the upper bowl is completely made up of bleacher bench seats that allow more capacity than chair-back seats. Unlike many arenas built in the years, it has no luxury suites. However, in 2001 the arena received some renovations including four oversize video boards, new lower bowl seating, new locker rooms. The first act to perform at Rupp Arena was Lawrence Welk on Sunday, the performance attracted 20,000 people to the newly opened facility. The ceremonial first basket in the new facility was sunk by Adolphs young grandson Chip, Rupp staged three Southeastern Conference mens basketball tournaments between 1982 and 1993, it was the host of the Ohio Valley Conference mens basketball tournament in 1992 and 1993. It hosted WWE Backlash in 2006, the Rupp Arena attendance record was set on January 2,2010, when 24,480 people watched #3 Kentucky play rival Louisville. Richard Andrew Rick Pitino is an American basketball coach. Since 2001, he has been the coach at the University of Louisville. As a college coach, Pitino has served at Boston University, Providence College. In addition to his coaching career, Pitino served two stints in the NBA, coaching the New York Knicks for two seasons and the Boston Celtics for three and a partial fourth. Pitino holds the distinction of being the mens coach in history to lead two different schools to an NCAA Championship. He is the coach to lead three different schools to a Final Four. In 2013, Pitino was elected to the Naismith Memorial Basketball Hall of Fame, in addition to his on-court success, Pitino has achieved a measure of success as an author and a motivational speaker. Pitino was born in New York City, New York and was raised in Bayville and he was captain of the St. Dominic High School basketball team in Oyster Bay, Long Island. He enrolled at the University of Massachusetts Amherst in 1970 and he was a standout guard for the Minutemen basketball team. His 329 career assists rank tenth all-time at UMass, as of the 2009–10 season and he led the team in assists as a junior and senior. The 168 assists as a senior is the eighth-best single season total ever there, Pitino earned his degree from the University of Massachusetts Amherst in 1974. Pitino is currently coach of the University of Louisville. Previous college coaching assignments include Boston University, Providence College, Pitino is considered by many to be one of the first coaches to promote fully taking advantage of the 3-point shot, first adopted by the NCAA in 1987. By exploiting the 3-point shot, his teams at Kentucky in the early 1990s were known as Pitinos Bombinos, even now, Pitinos teams are known for the 3-point threat and all of his teams rank towards the top in 3-point attempts per season. Many of Pitinos players and assistant coaches have gone on to successful collegiate coaches. Pitino started his career as a graduate assistant at the University of Hawaii in 1974. He was the first assistant hired by Jim Boeheim in 1976 as Boeheim began his tenure at Syracuse University, Pitino served as Hawaiis interim head coach late in the 1975–76 season. Junior varsity players are the members of a team who are not the main players in a competition, usually at the high school and college levels in the United States. The main players comprise the varsity team, for this reason, junior varsity teams are often called junior/sophomore teams. Especially skilled or physically mature freshmen and sophomores may compete at the varsity level, some private school associations may permit very skilled seventh- or eighth-graders to compete on varsity teams. At larger schools, there may be two junior varsity teams for sports, with a lower-level team typically consisting only of freshmen. Members of a varsity team are underclassmen determined by the coaching staff to have less experience or ability than those on the varsity roster. As such, junior varsity teams are used to prepare athletes to compete at the varsity level. Some teams require participation on a varsity team before being eligible to try out for a varsity team. These players can provide the varsity team with extra depth, with their service as back-up players, the NCAA previously prohibited true freshmen from playing varsity college football, as a result, numerous junior-varsity freshmen teams appeared on many major college campuses. The NCAA repealed this limitation in the 1970s, many sports teams have assistant coaches responsible for developing the talent of junior varsity players. A coach may call on one or more junior varsity players during a varsity game, especially when a varsity player is injured, is not performing well, or is disqualified from further competition. If a junior varsity player does well, they see more playing time in the future or may even get moved up to the varsity level. A team will have many talented players, but the coach is unable to come up with a rotation that allows everyone to play, the decision of when to play junior varsity players in a one-sided game is often at the coachs discretion. This depends on the strategy, the time remaining in the game, the point margin. Some games have rules which allow unlimited use of junior varsity players, other sports have different ways of determining junior varsity participants. For instance, in high school wrestling, there can only be one wrestler competing for a team at a weight class in a given varsity match. The Kentucky cheerleaders at Rupp Arena performing the traditional "Big K" cheer during a basketball game. Seating Capacity of Rupp Arena is 23,500. Pregame of 2005 Kentucky vs. Auburn game. Cornell University's Percy Field c. 1905. Sweetland played football on this field as a student at Cornell as well as coached against his former school while coach of Hamilton and Syracuse. Isaiah Hicks screens Jarell Martin and Marcus Lee for Chris Walker at the 2013 McDonald's All-American Boys Game. Calipari directing his players during an away game against Conference USA rival University of Houston in January 2007. Stegeman Coliseum in Athens, Georgia. In his rookie season, Dan Issel led the ABA in scoring with 29.9 points per game, and also averaged 13.2 rebounds per game. Casey (left) and his wife at the 2017 TIFF. Pelphrey during the 2009 Arkansas–Georgia game. A jersey honoring Hayden hangs in Rupp Arena.